The weather is a bit cloudy and not really ideal to take any good photo. The second problem that i had was not managed to look at the church in advance to get experiment with the church’s lighting condition. 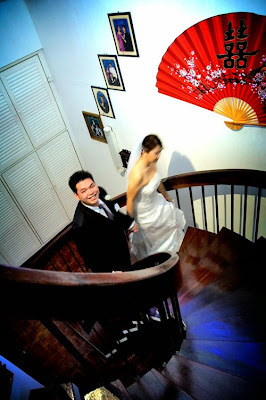 As usual, i started the photo shot at the bride’s home. It is quite a home with warm reception from the father and mother of the bride. 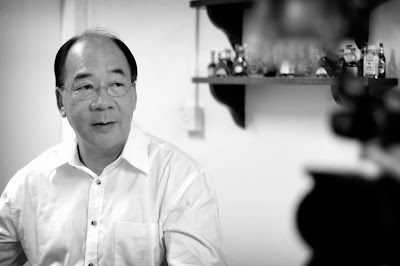 I use the 50mm f1.8 for a specific subject i want to take and a little bit portraits shot. 50mm f1.8 allowed me to take a portrait without artificial flash. Natural lighting from windows is a good for portrait photo for any subject. The photo above was taken during a cloudy day. Even thou the light was bright enough for a snap shot, the color not really projected very well and accurate that caused by the imbalance of the white balance. Cloudy day can turn the day a bit blue dull. 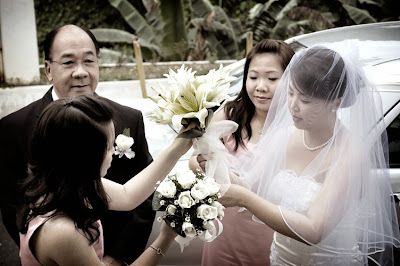 The bride’s father looking at her daughter arranging the flower bouquet with the help of her brides mate. 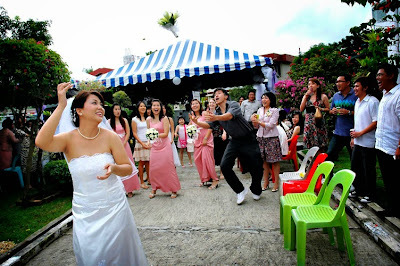 It is a classical example of wedding photojournalist technique. 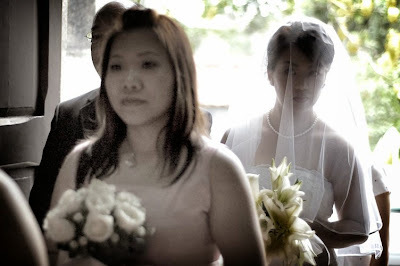 A silhouette effect with outer glow of the bride’s veil give a very interesting effect and give a curiosity and wonder impression to the bride when the most important day of her life is within the last few steps. The twin is so energetic during the walk to aisle. The movement blur shot was accidental but it turn out to be a very nice photo. 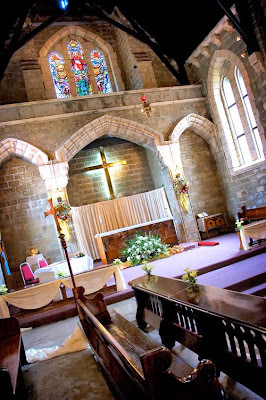 The altar view of St Michael Church in which the light shine bright in two directions giving a balance of amount of bright and shadow exposure. The bride was reading her vows on paper hold by Pastor Clarence. 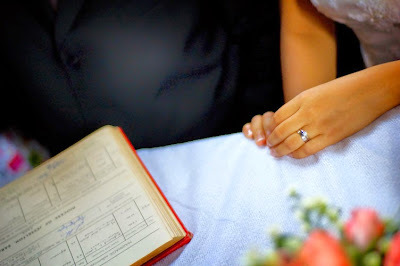 While waiting for the signing ceremony to start, i managed to snap a photo in which the ring on the hand and the wedding record book that is a witness of many previous weddings. The grooms kiss the bride reenactment because ceremonial kiss was too fast to be captured and i actually missed it. I always ask for second kiss reenactment because the couple was not anymore feeling nervous. 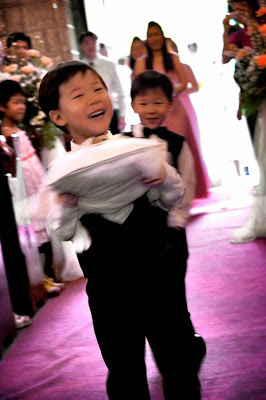 Flower tossing is a must for every western style wedding. 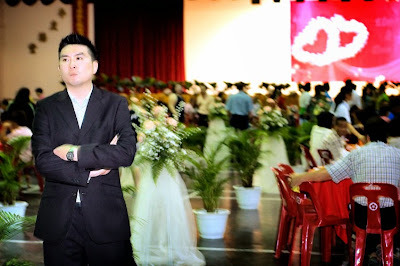 This is among the must have event photo in a wedding. Again, another movement blur photo that i turn out to be nice. The composition of the stair gives a swivel point to the photo. Personal portrait shot on the couple’s new room. A syn flash setting that was turn out to be nice. The dinner hall is so big i had to compensate the ambient light of the background with the front subject to avoid a dark background. 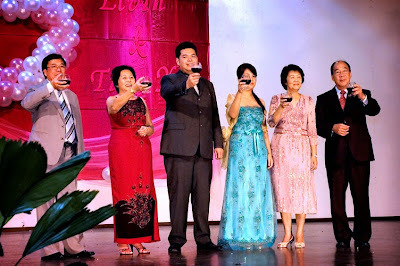 Yam seng is a Chinese wedding cheer from the guest to the newly wedded couple for good and happy wishes. 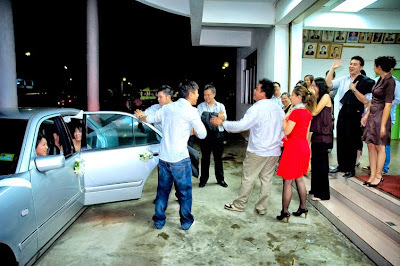 The chains line of people project a very interesting interaction between friends all the way to the bride inside the car. I took about 1500 photos on the wedding and processed about 200 pieces of photo to put in the customized photo album that i finished a moment ago. 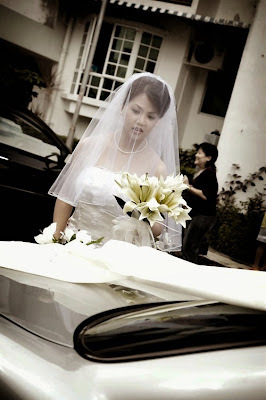 Most of the time spends on reviewing the photo and thinking the design and photo flow for the wedding book. 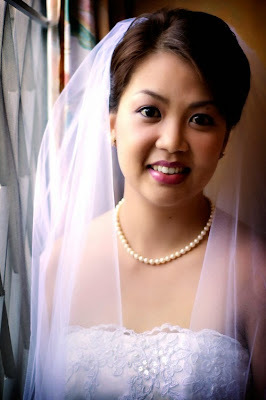 Designing a wedding book not easy for me and i need about one month to create an original and different book for each wedded couple. The job become even harder on the day that two couple want a wedding book for their photo in which i use about 2 month to finished it because i don’t want both book look the same. To see more photo of this wedding, please click here for the bigger slide. BEautiful! The church is so nice. I wanna get married at such a place. HEhehe..